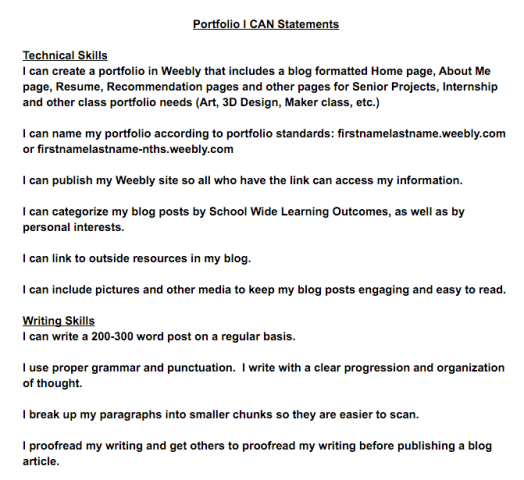 Included is the rubric used to assess all of the students who wrote blogs for several of my classes. View and download a PDF Version Here. The 9th graders represent the broad spectrum of students at New Tech, since they are required to take the Design and Computer Science Class I teach (Level 1 elective) in order to graduate our high school. The other class for which we will be looking at data came from my 3D Printing/Video Storytelling class (Level 3 elective) which is not a graduation requirement and includes students who have opted in to the subject matter. Level 3 students include mostly 11th and 12th graders, with only 2 10th graders thrown into the mix. It is a good representation of the upper class men at New Tech who show an interest in the Digital Arts. Click image below to see full document. Looking at the portfolio work done in several of my classes, I set out to assess ELA skills based on blog post writing tasks. As one would expect, those students in 9th grade included more emerging and developing writers and less in the to college ready column which include both the Proficient and Advanced Columns. In the level 1 classes there was an overall college ready rate for writing of 50% and a rate of participation of 74%. Upper grade students showed a higher participation rate as well as a higher rate of proficiency in college level writing when one considers college ready to be a combination of both the Proficient and Advanced column on the rubric. The data shown remained consistent when looking at the same criteria for a second blog post given later that semester that concentrated on documentation, rather than reflection. In the level 3 class there was an overall college ready rate of 71-73% and a rate of participation of 88-89%. 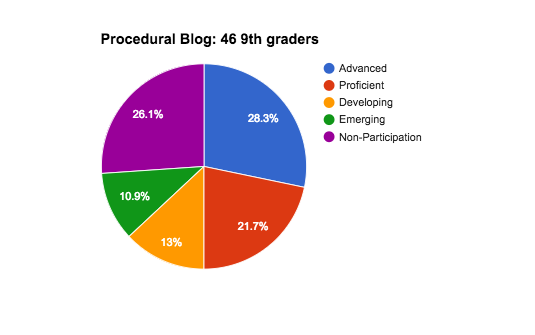 It is worthy to take a look at the higher levels of non-participation at the 9th grade level and what can be done to scaffold younger students as they begin their blogging process and learn to write in effective ways. There also needs to be extra scaffolding provided at all grade levels for students with special needs which include ELL's, students with special learning plans, students with mental health and home life issues, and those who are struggling overall in all of their classes. These data can easily be extrapolated to consider the overall population at New Tech High. It is clear that 9th graders need a lot more scaffolding in all subject matter and in all school wide learning outcomes. It would, therefore, be a worthy endeavor as the portfolio committee in spending time helping 9th grade teachers find proper scaffolding for teaching these skills. Exploration of Video blogging to help those students with special learning needs would be beneficial as next steps and is a part of what I have begun to explore in my own classroom. First and foremost for a 9th grade teacher would be to address the lack of participation at all in the blogging process and address those obstacles that get in the way of student participation. ​This is not a problem that is specific to blogging, as 9th grade students often need to find their footing in their first year of high school. Having said that, it should be noted that having successful students blog about strategies that work for them, and then effectively sharing those blogs with those students who are struggling, allows for students to learn from each other, how to navigate the requirements of a high school career. I am encouraged by the high level of writing seen from my upper level students. 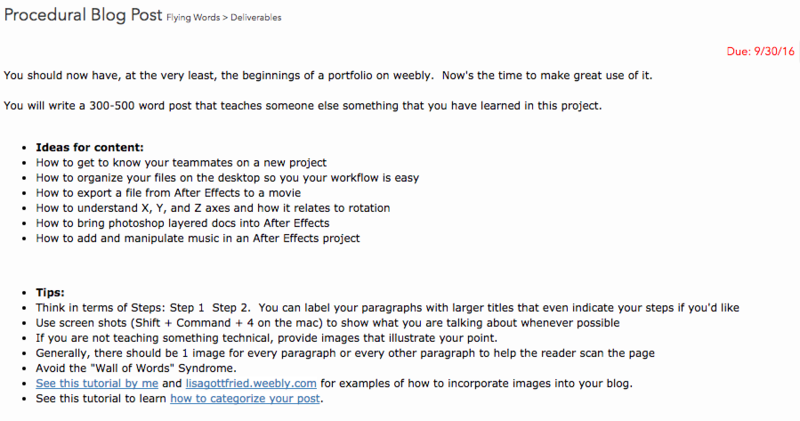 They have clearly grasped the idea of using their blogs to document, reflect, and teach. Their writing shows a higher level of skill. Areas that they can improve have to do with applying visual best practices in their posts and better understanding the audience for whom they are writing. These are all teachable ideas and I'm eager to show them how to improve in their blogging skills. It is also exciting to see that over half of the 9th graders are showing college ready writing skills at the beginning of their high school careers. It would be interesting to anchor these scores with the 9th grade ELA teachers at New Tech to see if they are seeing the same levels of college ready writing in their classes. I wonder if writing for a blog causes a higher level of writing to occur, due to higher levels of engagement, or if writing levels for other purely academic writing show the same correlations. Creative Commons Attribution-NonCommercial-ShareAlike 4.0 International License. Based on a work formerly at learnovationlab.org.